In a surprising little exchange in Monday's Independent, Harriet Harman was asked about the departing Cuban leader Fidel Castro. "Hero of the left, or dangerous authoritarian dictator?" was the question. And her answer? "Hero of the Left - but it's time for Cuba to move on". Harriet Harman's gaffe - if that is what it was - hasn't exactly been big news, but it seems to have created a few ripples at least. The Times's Danny Finkelstein had a cut-out-and-keep guide to Castro excesses which show up the old monster for what he really is. They included (embarrassingly for Harman) his policy of sending homosexuals to forced labour camps and his support for the murderous Mengistu regime in Ethiopia. Although some of Castro's more dubious actions, the political prisoners and press censorship, might indeed seem inspirational to some members of our present administration. Certainly, as yet, there's been no suggestion that a woman who, by her own admission, hero-worships an unrepentant communist dictator doesn't deserve her seat in the government. And, true to form, the BBC has thus far ignored the story entirely. Then this lunchtime, at Prime Minister's Questions, Conservative MP John Baron asked Gordon Brown whether he agreed with his deputy. And he made the somewhat gnomic response that "There can be no defence against the abuse of democratic rights in any country". Which, if you think about it, doesn't address the question at all. Or does it? After all, when someone has abused your democratic rights you don't generally have much defence left, except perhaps to climb onto the roof of the House of Commons and unfurl a banner. Cuba has never been a terror-state, and the Castro regime's achievements in health and education have been, considering the poor resources available, quite considerable. But it is in no sense a free society. The press is muzzled and opposition parties are non-existent. People are afraid to speak their minds. And now, the presidency has been handed from brother to geriatric brother in a manner not noticeably dissimilar to what goes on in Saudi Arabia. So how can a leading politician in a western liberal democracy possibly assent to the notion that Castro is a hero? To be scrupulously fair to Harman (a hard task, but someone's got to try) she didn't actually say that Castro was her hero. She merely agreed with the proposition that he was a "hero of the Left". It was, of course, open to her to say that he was "a hero of some on the Left, but not me"; but the fact that she didn't avail herself of this opportunity doesn't necessarily mean that she personally admired Castro. Although she probably does. However (very New Labour, this) it's now "time for Cuba to move on". Hidden subtext: "Let's pretend the old sod never existed, and forget I ever had a picture of him on my student wall". What neither the questioner nor, apparently, Harman herself considered was that the two parts of the question are not exactly incompatible. Being a "dangerous authoritarian dictator", which Castro undoubtedly was, at least with respect to the people of Cuba, doesn't preclude him from being, equally, a "hero of the Left". One might even think that the two go together like "Brussels" and "corruption", or "MP" and "expenses claim". Has there ever been a hero of the left who didn't have dangerously authoritarian tendencies? Tony Benn, perhaps, in his dotage, has been a doughty defender of Parliamentary democracy. But then he once described Mao as "the greatest man of the 20th century". Che Guevara, maybe, but only if you're prepared to overlook his involvement in Castro's Cuba. Which I'm not. Fidel (it's always "Fidel", isn't it; though no-one ever called Ceaucescu Nicky) has long exercised a potent appeal to true lefties. Although not conventionally good-looking (unlike Che), he had a certain style, what with the cigars and the fatigues and the revolutionary beard (carefully poised, in terms of luxuriance, about mid-way between Lenin and Marx). More importantly, there was his half century-long stand off with the Americans. Thumbing one's nose at Uncle Sam is an essential for anyone who aspires to Lefty street-cred. And it's certainly not difficult to feel some sympathy for the Cuban people (if not with their rulers) who have suffered from the short-sighted vindictiveness of successive US administrations. 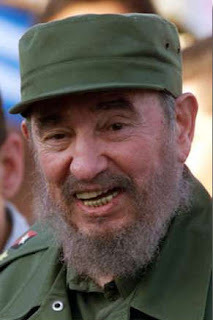 Other anti-Yank dictators shared, and continue to share, Castro's presumed virtue in this regard. The Heresiarch remembers a philosophy lecturer at Oxford who used to organise sponsored bike-rides to support of General Noriega, the imprisoned drug-smuggling Panamanian dictator. These days, Ken Livingstone indulges in alternative diplomacy with the likes of Hugo Chavez, whose authoritarian tendencies become steadily more apparent. But at least as important as the politics is the aura of romance that attaches itself to Lefty-approved dictators. From Stalin to (until recently) Mugabe, they may have committed atrocities, imprisoned opponents and promoted comico-sinister personality cults, but (so the theory goes) they had their hearts in the right place. They did it for "The People". And "The People", as opposed to individual people, have always been the Left's major concern. New Labour, often accused of selling out the Left, have also justified their excesses in the name of the great collectivity. In the chilling words of the 1997 Labour manifesto, "Our aim is to be the political arm of the British people as a whole". Small wonder that they have attempted to dismantle many of the protections which British people always took for granted against the overweening power of the State. The socialist mindset is Utopian. And all Utopianism tends towards coercion, because people are awkward and individualistic and don't always want to do what's good for them. In an advanced western democracy politics will always entail compromise and disappointment: even as they stealthily extend their control, New Labour statists find themselves having to justify their actions, and occasionally to retreat. They can't (yet) just lock up the opposition. This, I think, is why so many of them still have a sneaking regard for Castro. They envy him. What grubbing politocos will do for a 'soundbite'. Isn't Harmann the fragrant lady wot 'toe dropped' her loving hubby cos it wos getting too hot for her in Westminster? I thought that was Tessa Jowell, her hubby being Berlusconi's "adviser" David Mills. Harriet is married to Jack Dromey, the Labour treasurer who claimed to know nothing about the loans-for-peerages scandal, or indeed the Abrahams donation to her deputy leadership campaign. I think he's standing by her. They're a very incestuous bunch.